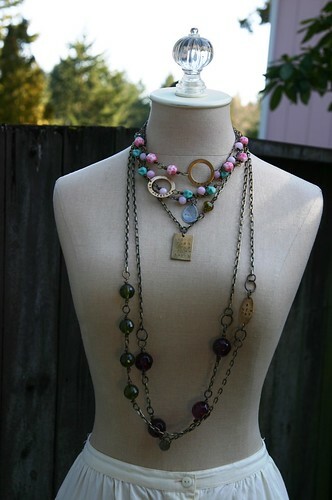 i have been having fun with vintage beads lately and am introducing a new line of soul mantra necklaces to the shop. because of the sparkles added to them, i am calling this the "all dressed up" soul mantra line. each necklace includes a soul mantra pendant along with a gathering of a few vintage baubles. the colors of these beads are making me so happy. i had such fun while taking product photographs in different ways. the truth is that product photos are so important on etsy, and i have often struggled with them. but lately, i have been thinking of other ways to bring interest to the photos, so that someone will take that step and "click" to investigate more. we so often fail to discuss the marketing side of our little shops. i know it might feel uncomfortable to admit that we are hoping someone will click and investigate what we have made. yet, isn't that what we are hoping for? i think it is safe to simply admit that yes, this is true. and even though i was freezing (snow on the crocuses this weekend), it felt good to push myself and play. it is a gift to again be invited to look at the lesson that reminds me that it is when our hearts are the most open, when a smile tugs at our mouths, when we can stand back and say, "yes. love this," that this is when we know we are really doing it. this is when we understand why we were lead on our path to this moment. and even though sometimes the path is so full of tangled thorny brush, i am grateful that the path brings me to a day in march where the sun shines on my head and i can take photos of what i have created and i can smile and just breathe it all in. Join the 3.7 million people who connect with me on Pinterest for a daily dose of inspiration, self-care ideas, and a few of my favorite things.